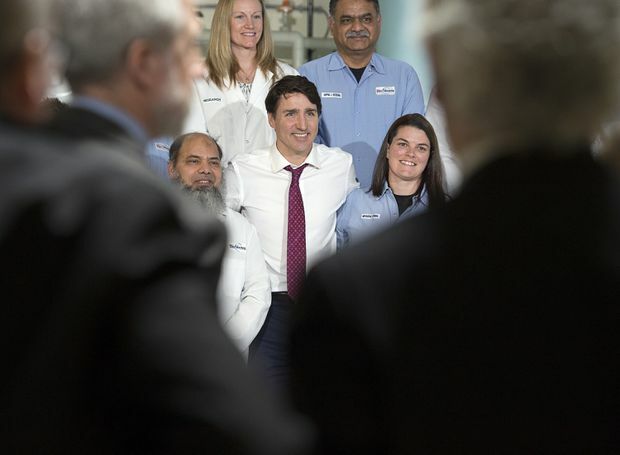 Prime Minister Justin Trudeau poses with workers as he visits the biotechnology company BioVectra Inc. in Charlottetown on March 4, 2019. Even though polls suggest Wade MacLauchlan’s governing Liberals will need all the help they can get to stay in power, sources close to the campaign say they haven’t reached out to their federal colleagues for support – a sign Trudeau’s one-time rock-star status on the island has become a political liability. But as candidates knock on doors in advance of Tuesday’s election, the voters who answer feel the need to vent about the prime minister, say campaign workers and insiders – Liberals and Conservatives alike – who spoke to The Canadian Press on condition of anonymity in order to freely discuss the state of play on the island. When Trudeau was last in the province in the weeks prior to the election call, he made a jobs announcement and attended a Liberal fundraiser. But a small group of protesters also showed up – a common feature of the prime minister’s public events elsewhere in Canada, but a rarity for Trudeau in P.E.I. PMO officials have said Trudeau prefers to steer clear of provincial campaigns, although he did lend his support to a provincial by-election effort in Ontario in 2016. And he visited P.E.I. on behalf of MacLauchlan’s Liberals in 2015, before becoming prime minister. But since voters don’t often draw a distinction between federal and provincial parties of the same name, canvassing voters during the campaign – especially at the outset, when the SNC fervour was most pitched – has often been uncomfortable for Island Liberals. “As much as Harper hurt things last time, Trudeau is helping now,” said one Conservative insider, speaking frankly on condition of anonymity – a sentiment echoed by others, including Liberals who remember the anti-Harper sentiment filling their sails.